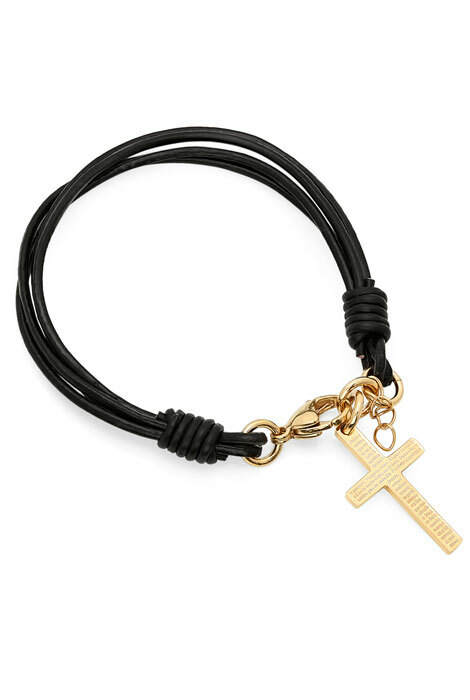 Celebrate your faith with this women’s leather cross bracelet. Dangling from the genuine leather braided band is a cross engraved with the padrenuestro. This charm bracelet is made with 18k gold-plated stainless steel, a quality choice in jewelry design because of its beautifully polished finish, durability and resistance to rust, oxidation and discoloration, even in humidity. 7 1/2” L leather bracelet with 2 1/2” L x 5/8” W cross and lobster clasp. Polish with a soft, dry cloth. Allow 2–3 weeks for delivery.